Thanks to the drought 😦 , the mosquitos that usually make the Sky Lakes Wilderness a forbidding place in July and August didn’t materialize this year in their usual great numbers. 🙂 We’ve been taking advantage of their absence to explore most of the trailheads that allow one to access different parts of this long, linear wilderness – which stretches along the Cascade Crest from Crater Lake National Park to Mount. McLoughlin. Today we we checked out the Cherry Creek Trail (USFS #3708), which is the one just south of the Nannie Creek Trail. This one is lower (about 4,800 feet) and the hike in to the lakes is longer (about 6 miles) than via Nannie Creek, so it was not surprising to find it much less used. Because of erosion damage, it’s currently closed to stock, which only adds to its less used aspect. It is also entirely in the forest, with no real views until you reach the lakes. This is Hike #139 in Sullivan’s 100 Hikes in Southern Oregon (3rd Edition). and a meadow or two. The trail had seen some recent maintenance and was in generally good condition, but there were some very large, recently downed trees that we had to work our way around. After about four miles, the trail started climbing through the forest on long, languid, switchbacks that were not shown on the map. The guides say it’s only 5.2 miles from the trailhead to the lakes but we found that these switchbacks added a mile to that. So, after about 6 miles, we reached our lunch stop at beautiful Trapper Lake, with Luther Mountain on the horizon. 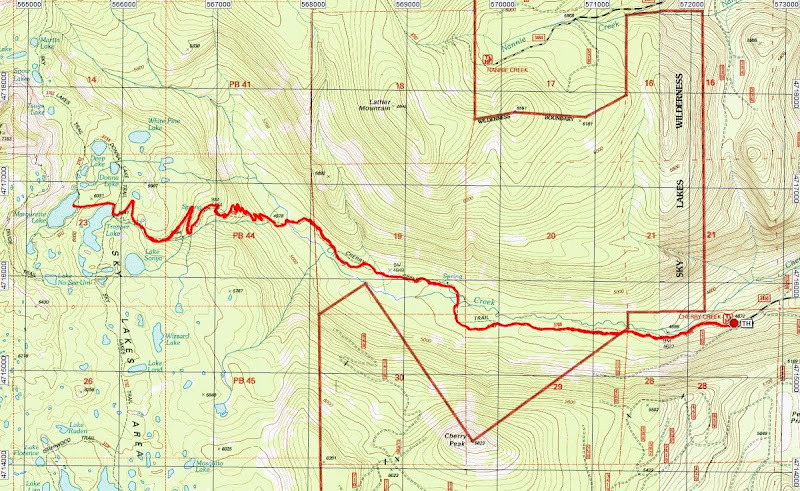 The Pacific Crest Trail (PCT) runs along the ridge on the horizon and the Divide Trail (USFS #3717) connects it to the lake basin. nestled at the base of Luther Mountain (supposedly named to counteract the influence of Devils Peak just to the north). We returned the way we came. This was a good out-and-back hike (13 miles round-trip; 1,300 feet of elevation gain) but, all told, the Nannie Creek Trail seems like the better way to access these lakes from the east.